Industry recognized online pre-qualification training is not offered by any other training organization...no other...you can only get it here at the Inflight Institute! Many Member Airlines require you to have a certificate from the Inflight Institute before applying or attending their airline's ground school. Unsure of which course is right for you? Let us help guide you with our course selector. Completing a certificate program may reduce the live training time that an airline needs to provide you to get you flying...it just makes sense and our member airlines LOVE it! Pursue the training that many airlines require! These programs are for those students who wish to expand their knowledge and truly learn about specific areas of the aviation industry. Covering areas from how to get started to advanced aviation medicine, and beyond. All Inflight Institute programs are currently being used by airlines and training organizations around the world. This course will prepare you for live medical training at your airline. Learning Inflight emergency medical situations is not easy. Be prepared to experience an introduction of how Cabin Crew help! The extensive information within this unique program could help you avoid a potentially explosive situation inflight. 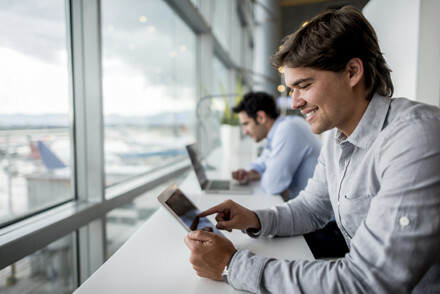 This exciting program will help you see things from the passengers' point of view and how to create positive, memorable customer service experiences which are vital to airlines. Learn to be a leader! Providing inspired understanding of how to lead a team, coupled with advanced communication and decision making. Receive a one-on-one telephone tutoring session with an Inflight Institute recruiting expert. Gain an inside view of the profession. International regulations require all crew members to be certified in the recognition of dangerous materials onboard. Learn about international food safety protocols that are a necessity during inflight food service. Through our aircraft type courses you will discover some of the most interesting aircrafts in the world. Select the airplane that you would like to learn about and you are on your way to exploring inside the cabin, flight deck and emergency equipment. Learn about the de Havilland Dash 8-100 aircraft, one of the most popular single flight attendant aircrafts. This course covers the Boeing 737-700 NG (Next Generation) aircraft. One of the most popular medium range aircraft in the world. The most popular aircraft ever made, a narrow body jet aircraft with multiple flight attendants. A highly utilized narrow body regional jet designed for short to medium haul regional flying. Operated by many airlines on shorter haul routes to transport passengers to and from a “hub” location. Join the world of international airlines. One of the most popular multi-aisle aircraft in the world. Over 6000 A321s are in use today, making it one of the most popular single-aisle, medium to long haul aircraft in the world. A narrow body jet aircraft flying to hub locations, connecting with larger aircraft. Commuter and Air Taxi operators can protect their operation against costly fines for non-compliance through this unique program. Exclusively for those in or being promoted to executive positions within an airline's inflight management. Excel at regulatory affairs, while maintaining a balanced approach to airline management realities. All course times are based on individual performance and are meant as a general guideline.